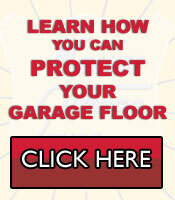 A vinyl garage mat is one way you can keep your garage or shop flooring clean and free of stains. No more worry about stains spreading over the floor from corrosive materials that will cause permanent damage. Installing vinyl garage flooring is a good protective choice for your personal garage as well as for your shop. A garage mat is easy to keep clean by simply hosing it down with water, using a broom, or using a wet vac. Krauss Surface Saver is a patented Canadian and US product that has been accurately tested since 1996. Our vinyl garage flooring will last you for many years to come and has a six month warranty on workmanship. You’ll quickly find that your garage area looks tidier and is much easier to keep clean when you order one of our garage mats. Our vinyl garage floor mat is designed to keep stains off the floor and on the mat. The perimeter edging of the mat is raised ¾ of an inch to ensure enough height to keep water and fluids contained within the mat area. The edging can be driven over without damage, such as cracking, by all vehicles and under most weather conditions. When not in use, the mat can be easily rolled up and stored or shipped to another location. Manufactured from a vinyl coated polyester weave. The polyester is coated with U.V. coating to protect the mat from the sun. The mat comes in a pleasing green color that is 22 oz. per square yard. Available in sizes 7.5′ x 19.5′, 7.5′ x 18′, and 7.5′ x 16′. The mat can be easily moved from one garage to another. No matter what size your garage is, our Krauss Surface Saver vinyl garage floor mat will fit all required dimensions. Gone are the days when you find yourself working on your vehicle only to realize that you’ve left stains on the flooring of your garage. Some of the stains our mat will protect your floor from are water, oil, gas, antifreeze, and salt. Ordering is easy and can be done by phone, fax, or email. We focus on great customer care and ensure that your order is handled personally from beginning to end. At Garage Mat, we take pride in bringing you a unique solution for messy garage or shop flooring. To find out more about our vinyl garage flooring, contact us today.